The mission of the IATA is to improve the quality of healthcare in the State of Illinois through the advancement, promotion, and improvement of the athletic training profession at all levels, and to promote a better working relationship among those interested in athletic training by providing a means for a free exchange of ideas. The 2019 Elections will be for the positions of President-Elect, Vice-President, Secretary, Region 3 Representative and Region 4 Representative. We will also be accepting applications for Governmental Affairs Director (GAD), which is an appointed position. The IATA BOD voted last fall to restructure the GAD position as follows: Appointed to one year as GAD-Elect, two years as GAD, one year as Past GAD. This structure is in line with the President position and will allow the individual in the role to spend a year being mentored by the current GAD, and one year doing the same for the incoming GAD when his/her term is up. Given the unique skill set required for this role, we decided to go in this direction to set IATA up for future legislative success and to supplement the existing structure. Those interested are asked to submit a resume/CV, letter of interest and two professional reference contacts to Kristen Streeter at kmstauffer18@hotmail.com by June 1, 2019. President Odean-Carpenter and Streeter will review all candidates, conduct phone interviews, and make a recommendation to the BOD for approval at the August 2019 BOD meeting. The term of GAD-Elect would begin in November 2019 and end in November 2023 as Past GAD. If you are interested in an elected position, please complete the application and email it to Past-President Matt Munjoy at mmunjoy@comcast.net. You may also contact Matt if you have any questions about the positions. The deadline to submit your election application is August 1, 2019. 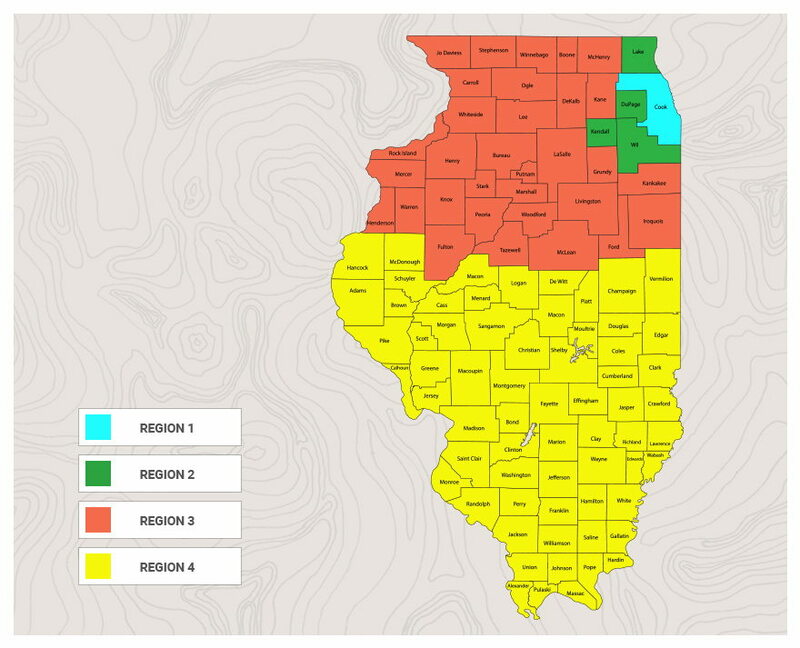 As a point of reference, please use the region map below if you are unsure of what Illinois region you fall into.